Household indebtedness and imbalance in the housing sector are key vulnerabilities to Canada’s financial sector, the Bank of Canada says in a financial system review. Specifically, the central bank is worried about young people who have taken on high levels of debt so they can buy homes in expensive markets. The number of households with debt-to-income ratios of 350 per cent and above — considered highly indebted households — has doubled in the past 10 years to eight per cent of the population, the bank said. About 80 to 87 per cent of the debt is from mortgages, it said. Many of these overburdened homeowners are in markets in Ontario, British Columbia and Alberta where house prices have escalated. “Income growth hasn’t kept pace with the growth of borrowing, as house prices have continued to rise in these markets,” Bank of Canada governor Stephen Poloz said in a news conference in Ottawa. He estimated there are about 720,000 such highly indebted households in Canada, and they are a concern because they are concentrated in pockets. Debt and housing are the same problems flagged in last financial system review six months ago, but the vulnerabilities are “edging higher,” Poloz said. The risk to these households is an economic downturn that could result in widespread job loss, the bank said. “Household vulnerabilities could be exacerbated by a severe recession that is accompanied by a widespread and prolonged rise in unemployment,” the central bank said in a news release. Poloz said in his news conference that he is not predicting such a downturn, nor does he believe the banks are at great risk, because of strong underwriting practices in Canada. Last week, the federal government tightened mortgage rules, with CMHC requiring a 10 per cent down payment on the portion of any mortgage it insures over $500,000, up from a five per cent down payment. 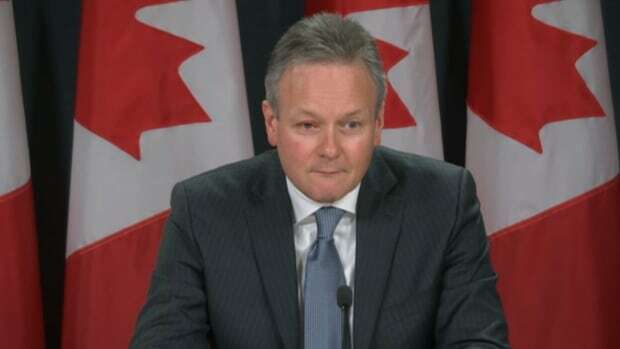 Poloz says the Bank of Canada advised Ottawa on the changes and expects they will help cool some excessive borrowing. “Recent changes to mortgage financing will mitigate these risks as we move into 2016,” he said. Poloz said the central bank still has more tools to try to address risks in the housing market if it needs them. The bank said it believes that the Canadian financial system is resilient and that the global financial system has been made safer through the implementation of recent reforms, such as larger capital reserves at financial institutions. a sudden increase in global risk premiums which would lead to higher borrowing rates. stress emanating from China and other emerging-market economies. prolonged weakness in commodity prices. Canadian banks are exposed to low commodity prices, as are all parts of the economy, but they are resilient enough to withstand the shock, Poloz said.